This $107 Space Shuttle Columbia novelty note was designed as a memorial to the astronauts lost in the space shuttle STS 107 mission. Has the mission patch on one side together with the portraits of the seven astronauts who perished during the flight (including Ilan Ramon of the Israeli Space agency and Kalpana Chawler,1st Indian-born woman in space). 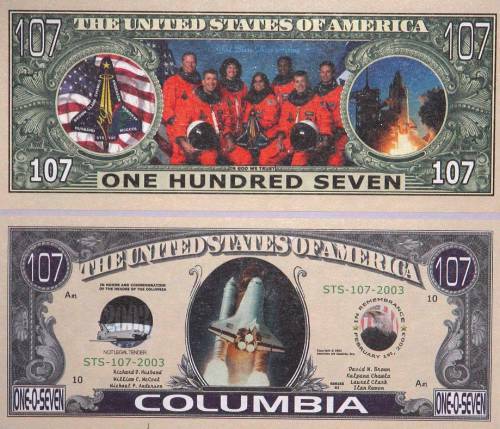 The other side portrays a shuttle lifting off, lists the names of the astronauts, and carries the words "In Rememberance February 1st 2003". Brand new item, not legal tender.